Email services will usually restrict the size of email (the attachment plus the email content itself) send or receive. For example, Gmail only permit up to 20 megabytes (MB) in size. An alternative to send large file, is to host it elsewhere, and send the link to the recepient, to download. Some free file hoster are SaveFile, MediaFire, and RapidShare. What we need to do are first, upload the file to the free file hosting service. Second, grab the file link, and third, email the link to the recepient. However, we can actually reduce the number of steps to just one, using the free service from filesfrom. 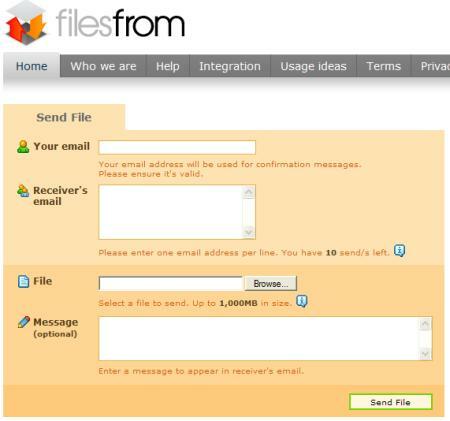 Just enter the sender and recepient email addresses, choose file to upload, and click send, in the provided form, as shown in Figure 1. Hi, Thanks man for da info....make life easier to send large shipment! File Apartment is another option..
You can send files up to 5Gb through their website, and you can also send files using your usual email program. They offer free and paid accounts. Their website has a really good description of how these large email attachment sending services work.